Your wedding day is unique and deserves very special attention. With Padrino's worry-free wedding packages, you'll have the most complete and well-prepared bridal service possible for your special day, perfect to the smallest detail. 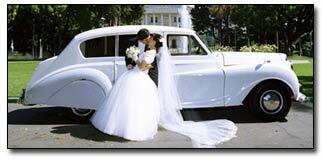 We treat our brides and grooms in the graceful manner this occasion merits, and get them to the church on time, and in style! After the party, wave 'bon voyage' as you ride away in your stylish carriage to begin your special getaway. Have a wonderful time! Of course, the scope of our service can include your entire family, so treat those special relatives to a Miami or South Beach tour while they're here. And how about the bachelor and bachelorette parties? You'll have more fun in a limousine or luxury bus - and we're the designated driver! What a luxurious way to be safe and enjoy yourself! The balance is due on the day of the wedding in cash or credit card. Whether your wedding is next month, or next year, reserve your limousine as soon as you have a date and time. Just call Padrino's Client Services team to book your service. Availability is always limited during the most popular months, so remember, it's always prudent to reserve early!